The National Archives, guardian of the Constitution and other historic originals, is opening a state-of-the-art theater as part of an interactive museum designed to lure more visitors to the researchers' haven. Since refurbished originals of the Constitution, Bill of Rights and Declaration of Independence went on display a year ago, almost a million people have passed through the rotunda at the downtown headquarters of the National Archives and Records Administration. On Thursday, the Archives will inaugurate the 290-seat William G. McGowan Theater at its headquarters, located on Pennsylvania Avenue halfway between the Capitol and the White House. The ceremony will premiere an 18-minute video on the refurbishing and re-casing of the three documents, called "Preserving the Charters of Freedom." It also will include presentation of the Archives' first "record of achievement" award to David McCullough, biographer of Presidents John Adams, Theodore Roosevelt and Harry Truman. Clips from historic films, some taken a century or more ago, also will be shown at the ceremony. The Archives has the world's largest collection of noncommercial movies: 300,000 reels of motion picture film and 200,000 sound and video recordings. Preservation of the historic documents required more than two years of work. 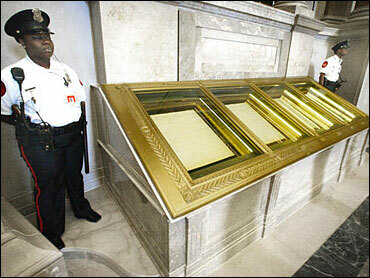 The Declaration of Independence, now faded and largely illegible, was taken from the building by truck under the code name "Elvis" to a vault in the Archives' building in suburban College Park, Md. The documents were preserved in their present state. After the theater opens to the public Friday, the video will be shown 14 times a day, admission free. An hour-long version is due in February. The Archives plans to open its new 8,000-square-foot interactive museum in November. A learning center will be added by 2006 to complete the agency's new public face. The new museum will be called the "Public Vaults" and will give visitors firsthand experience of historical events, like listening to tapes of President Kennedy discussing the Cuban missile crisis with his advisers. It also will enable amateur filmmakers to dub video from raw World War II footage and let history buffs examine the coded German "Zimmerman telegram" promising a return of California to Mexico if it would cooperate with Germany in World War I, or read declassified U.S. plans to heat up the Cold War with the Soviet Union. Most of the billions of military, immigration, congressional and administration records dating back to the Revolutionary War that the Archives maintains are housed in the agency's College Park building. McGowan founded MCI Communications Corp. and headed it until his death in 1992. His William G. McGowan Charitable Fund Inc. donated $5 million to the Archives last year, almost one-fourth the amount needed for the "National Archives Experience" that includes the theater and the museum.